Ever since a brief December 2002 article in the New York Times in which Howard Goldberg reviewed this Spanish red wine made from the monastrell grape, Spanish for mourvèdre in southern France, I have been searching for a bottle. Goldberg wrote (of the 2001 vintage): "This delicious unfiltered, filling red, chockablock with raspberry and chocolate flavors, is so dense it is almost a liquid cake." The article directed readers to W.I.N.E. at Eli's Manhattan on the Upper East Side, but as typically happens when a story runs like this, the shop was immediately sold out. Nevertheless, I found a bottle of the 2002 vintage at The Wine & Spirit Co. in Queens. Extremely full-bodied and robust, it may not be "liquid cake," but it is very tasty, especially for the price. 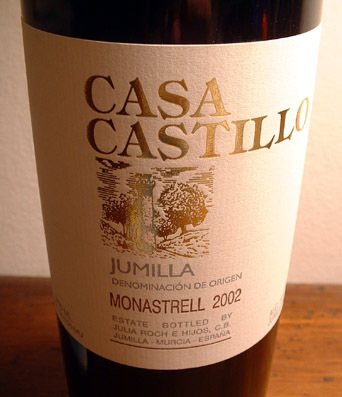 The 2002 Casa Castillo is $9.99 at The Wine & Spirit Co., 108-50 Queens Blvd. (718.575.2700). -The links to food-related websites and blogs, formerly listed as "Pantry," have been updated and expanded into METRO, NATION, and WORLD in the right column. -All of the "Appetizers" have been moved to a link-list in the right column. They now have their own archive and feed. I put the OXO swivel peeler to the test and made a cucumber salad, shaving an English cucumber lengthwise into wide ribbons and adding the juice of a lemon, some olive oil, chopped mint, salt, and pepper. Attacking the cucumber with the peeler was easy, and the result was crisp and refreshing. At $5.99, it's not a major investment to buy a gadget like this. Time to test that Messermeister serrated swivel peeler . . .
1. 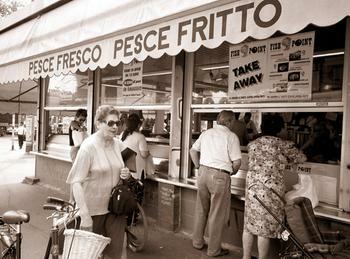 Friuli New York 2003, a celebration of the food and wine of Friuli in northeast Italy, begins on Thursday, September 25, and continues through October 13. Multiple tastings and special menu offerings at New York City restaurants and markets (see calendar). 2. A Moveable Feast: Family Style, offered by The New Yorker, featuring food from WD-50, Savoy, Fleur de Sel, among other restaurants, Thursday, September 25, Chelsea Art Museum (556 West 22nd Street at 11th Avenue), $100-150/person (866.468.7619). 4. The Great Match: Wine and Tapas 2003, a tasting of Spanish wines and tapas, at the Regent Wall Street Hotel (55 Wall Street), Monday, September 29, 5:30 to 8:30 p.m., $70/person (866.849.8703). 5. Tasting of the artisanal cheeses of Portugal on Monday, September 29, 6:30 to 8:30 p.m., at the Artisanal Cheese Center, 500 West 37th Street (at 10th Avemue), 2nd Floor, $75/person (877.797.1200). 6. Third Annual Taste of Wall Street, featuring food and wine from Danube, Le Zinc, and Salt, among other restaurants, Tuesday, September 30, 6 to 10 p.m., at the Regent Wall Street Hotel (55 Wall Street), $150/person. "Calce" means lime in Italian, but I am not sure if the "calce" in the name of these olives refers to their appearance or their flavor. 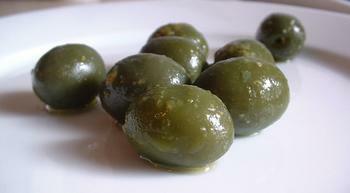 With their vibrant, dark green color, the olives, which seem to be a specialty of Calabria, resemble little limes. Salty and rich from the oil in which they are packed, olives alla calce have the very subtle flavor of anise taken from the fennel with which they are cured. Olives to the lime Of the variety ciucce. Greens are collected and they are put in wood troughs. For every 4 kg of alive olives 1,700 kg are taken of lime and 3 kg of oak ash and they are melted in the water in which the olives will be macerated. Made to rest for a day, they are removed from the water, they are washed with fresh water for 2-3 days. Then they are passed in troughs and in fresh water in which they are poured approximately 100 g of knows them, seeds of finocchio, leaves of bay and rametti of mirto. Olives alla calce are $4.99/pound at Fairway. 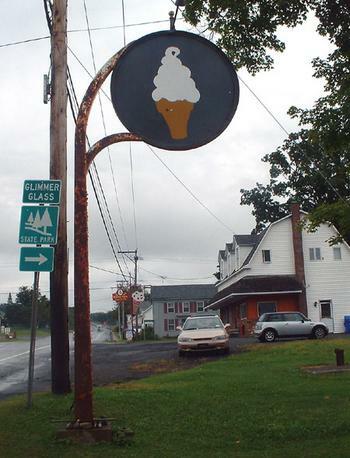 Postscript (10/08/03): I contacted Fairway and traded a few emails back and forth with Steven Jenkins. He indicated that the olives are, in fact, cured with lime, or "lye," which serves to preserve their green color. There goes the lime (fruit) idea! Mr. Jenkins also described that the lye provides the mildest (blandest) cure. While these olives are, admittedly, blander than most others, I think that the mild cure allows you to taste the distinct fennel flavor. Steven Jenkins explains: "Why these people term them "alla calce" is to communicate to their public that the olives are lye-cured, therefore much milder, less olivey-tasting." Moreover, "The lye and aeration (oxygen) serve also to eliminate an olive's natural color. That Pugliese "alla calce" olive is a decidely unworldly hue." The Food Section is officially becoming www.thefoodsection.com through TypePad's domain mapping feature. It is possible that jtown.typepad.com and jtown.typepad.com/foodsection may no longer access this site, so please update your links to reflect the new url. 1. New Yorker Festival Friday Night Dinner, with Alice Waters of Chez Panisse in Berkeley, California, Dan Barber of Blue Hill in New York City, Rose Gray and Ruth Rogers of River Cafe in London, and Peter Hoffman of Savoy in New York City, followed by a roundtable discussion moderated by writer Adam Gopnik. Friday, September 19, 6:30 p.m., $400/person [!] (877.391.0545; ticketmaster). 2. "A Point! Peak Cheeses in Prime Season" at the Artisanal Cheese Center: A tasting of "a selection of 8 of the prettiest cheeses from our caves in a range of categories." Monday, September 22, 6:30 p.m. to 8:00 p.m., $75/person. 500 West 37th St. at 10th Ave., 2nd Floor (877.797.1200). 3. Tribeca Cook-Off, featuring a head to head "battle" between chefs from Danube, Layla, The Harrison, fresh, and Scalini Fedeli vs. five FDNY firemen. Tuesday, September 23, 7 to 11 p.m. at Tribeca Rooftop, 2 Debrosses Street, 12th Floor, $150/person. N.B. : Harvest in the Square rescheduled from September 18 to October 2 due to hurricane threat. Giuliano Hazan has a recipe for Fusilli ai Porri e Salsiccia (Fusilli with Sausage and Leeks) which is extremely simple to make and has a great contrast of mildly sweet and savory flavors. The sauce starts by cooking Italian sausage, removed from the casing, with a small amount of water in a large sauté pan (I don't know exactly why the recipe calls for water here, but when I followed the directions, the recipe did come out well). As the sausage cooks, break it up into small pieces with a wooden spoon. When the water is gone, and the sausage has started to brown slightly, the leeks are added, which have been cut into very thin strips, along with butter. The sauce cooks covered until the leeks are soft and wilted (around 20 minutes). 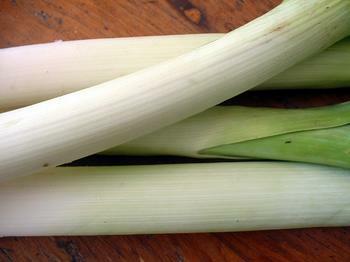 Don't be concerned about the amount of leeks you start with, because the volume reduces significantly as it cooks. Add the fusilli, some of the pasta cooking water, and grated parmigiano-reggiano. I used a fresh fusilli pasta from Agata and Valentina that was surprisingly chewy and more resilient than the dried version. Salty, sweet, rich, and hearty, the recipe was a culinary farewell to the salad days of summer.